The beautiful Bay Tree House is a classic dolls house that is sure to delight any little one with a doll family looking for a stunningly palatial home. Made with an eye firmly on quality and style by our friends at Le Toy Van, Bay Tree House is a timelessly elegant three story manor house, with a striking circular main window, an imposing central staircase, a loft ladder and opening shutters, windows and door. Painted in easy clean paint in a soft pink with wonderful ornate embellishments, Bay Tree House is a stunning addition to any little one's bedroom. This is a stunning dolls house, with beautiful details, that's sized to look substantial, but fit perfectly in little hands. The roof cleverly comes off to reveal a third storey, so there's lots of space to create different rooms and play scenes. 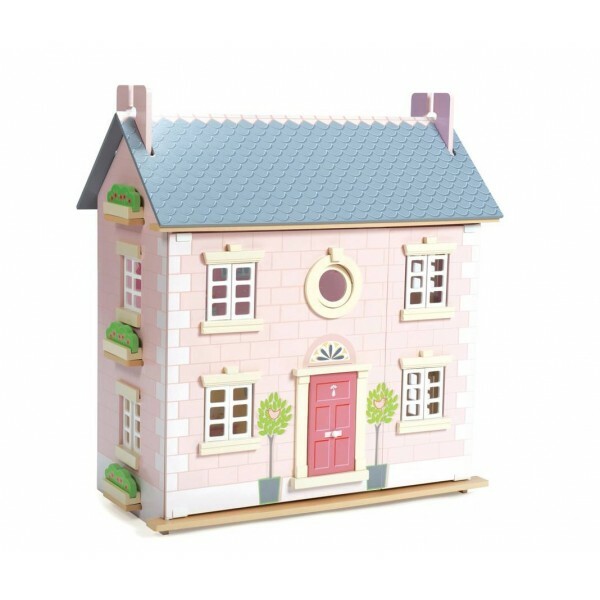 Bay Tree House is designed to fit seamlessly with all Le Toy Van's Dolls House accessories and play sets.